Having grown up in the 1990s and 2000s, I didn’t really have the opportunity to spend time at an arcade. When PJ Gamers opened up in Broken Arrow, Oklahoma and did so with dozens of arcade cabinets, I was excited. More so than any other, Gyruss has captivated me. 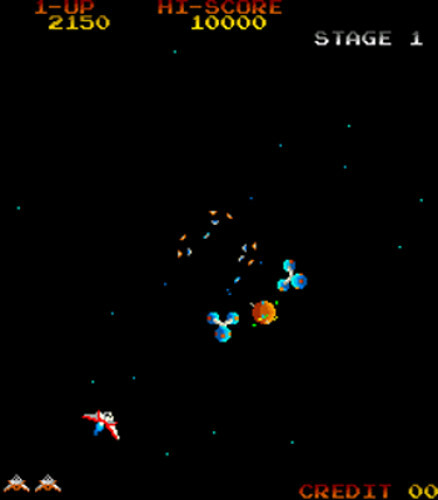 It’s a 1983 space shooter emulating the gameplay styles of Galaga and Tempest, in fantastic fashion. Besides featuring pure gameplay that’s so common in most arcade classics, a high score competition between my friend and I has kept me hooked. Blasting that orange sphere granted the double blaster power-up. Controlling a spaceship and having it revolve around the screen in a tubular manner took some getting used to. 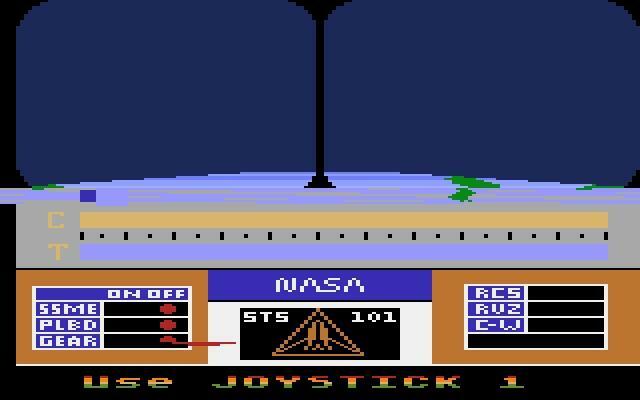 The spaceship mirrored the position of the joystick, which I haven’t experienced too often. Likewise, the waves of enemy spacecraft entered the screen any which way across the twenty unique stages. There were enough enemy types and wave formations to keep the game fresh and the sole power-up was fun to obtain, and definitely worthwhile. Another holdover from Galaga were the challenging stages breaking up the pace. Memorization proved to be influential in succeeding, but so too were quick reflexes and calmness. Blasting an enemy wave early on. Having spent enough time learning the gameplay and adapting to the rule set, success was ultimately, in my hands. After a month or so, my friend still reigns supreme with a score only 10,000 or so more than 200,000 odd points. I’ve lost the fire to try multiple times a week, but I do give it a shot every time I visit PJ Gamers. Gyruss has tuned into one of my favorite arcade games and I believe it to be incredibly indicative of the golden age of arcades. This, because of its pure, simple gameplay and rule set and its emulation of the pioneers that came before it. Ironically, these elements make it feel unique, while still feeling so similar to its golden age contemporaries. Dang. 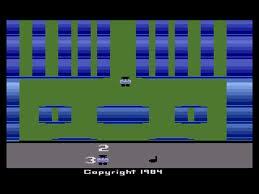 And I wanted to play this on my Atari 7800 too. 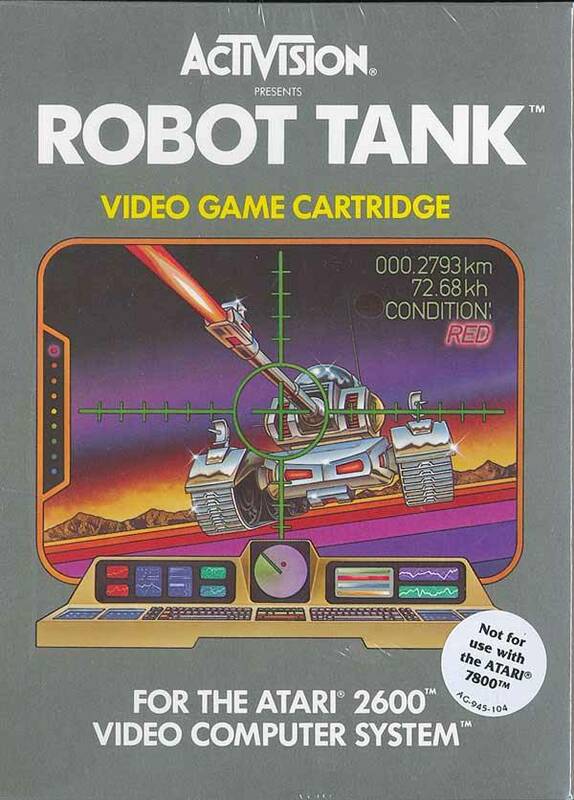 Serving as Alan Miller’s last game for Activision, Robot Tank is a game that’s… familiar. Very much Activision’s answer to Atari’s Battlezone, Robot Tank plops players down in their very own tank and has them countering an invasion of enemy tanks onto U.S. soil. The ultimate objective is to prevent the enemy force from reaching Santa Clara, California. 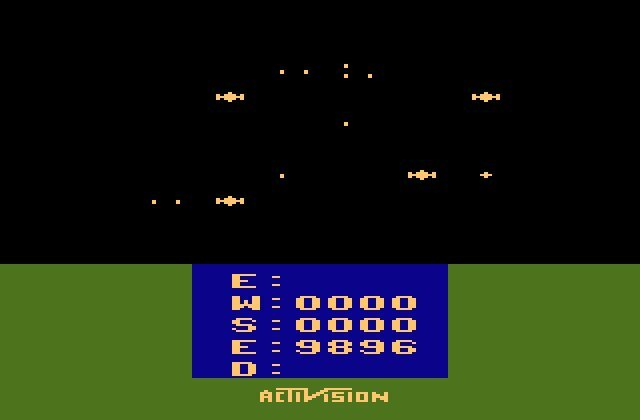 With gameplay that’s just as good as the majority of Activision’s catalog, it’s the heads-up display and mechanics that merit the most discussion. The heads-up display is a big part of Robot Tank. The actual “window” looking out of the tank is arguably more important, but without the dash of devices housed inside the tank, players wouldn’t get far. The radar is a must as eyesight will only detect so much, especially in unfavorable weather conditions. Damage sensors assist in knowing what functionality has been lost – if it wasn’t already apparent. There’s a clock relaying the time and a counter of the enemy tanks destroyed as well as how many lives are left in the player’s stock. One of the coolest mechanics of Robot Tank was the deterioration of the player’s tank. Rather than a one-hit kill scenario, the tank slowly lost functionality as it was barraged. There were a few parts that could be destroyed – video, cannons, radar, and treads – and when they were, the corresponding function would no longer work. It seemed random as to what would be destroyed, but it was challenging having to manage the tank when it wasn’t operating completely. Every kill in this weakened state was all the more enjoyable. 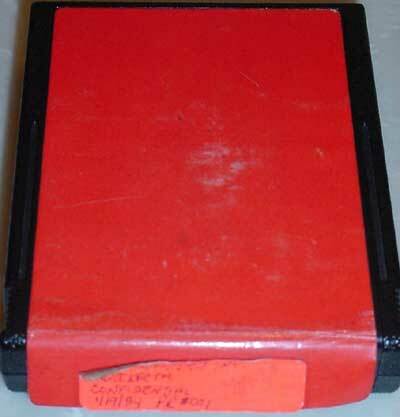 With that noted, one of the weirdest mechanics of Robot Tank, and probably one caused by the technology of the Atari 2600 rather than this game’s design, is the ability to guide the cannon fire. 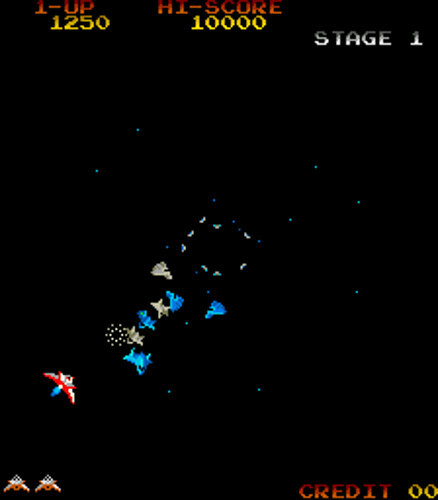 After being shot out of the cannon, it would move from side to side if the player did. This is something that has been present in quite a number of Activision’s games. It makes for interesting offensive and defensive maneuvering, but strips away any sort forethought into planning when and where to aim and shoot. The employed method is more in line with the fast-paced gameplay though, more so than one that would require thoughtful timing. There’s a lot on the HUD for the player to take in. 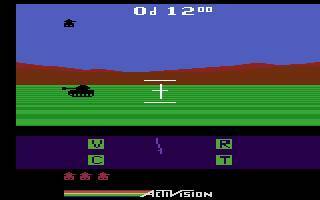 I wasn’t captivated with the gameplay of Robot Tank, but I appreciated the handful of interesting features and think it deserves a place in Activision’s catalog of quality Atari 2600 games. Originally there were three tiers of patches to earn. Each was awarded after destroying 48, 60, and 72 enemy tanks. Only the first is present in Activision Anthology. Although there is an additional gameplay mode to unlock with 37 kills – “breathing mode”. Reminds me of Sealab 2021. 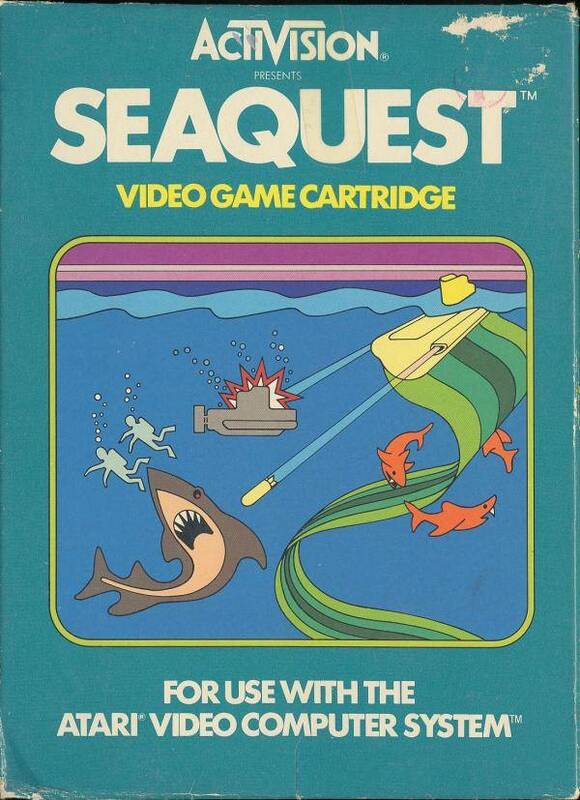 Seaquest is a very straightforward game. As the pilot of a submarine, the player’s sole task is to rescue treasure-divers from the clutches of sharks and enemy submarines. Shooting enemies and rescuing allies provides points for as long as a player has lives. 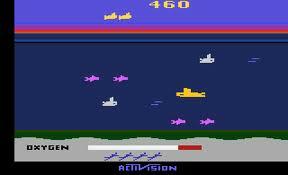 Taking place on a single screen, players evade or destroy waves of enemy subs and sharks as they enter view. Occasionally, a treasure-diver will float onto the screen. With six divers onboard, returning to the surface will end the “stage” and players will begin anew with a full supply of oxygen. Oh yeah, players have an ever-depleting supply of oxygen they need to be wary of. The simplicity of the gameplay coupled with the relatively unimaginative concept of the game lead to me losing interest quickly. Not Steve Cartwright’s best. Enemy subs and sharks need to be avoided or destroyed. With a score of 35,000 points in Activision Anthology, players will unlock the “Sub Club” patch. Originally players had to achieve 50,000 points. For me, this would be a futile effort reminiscent of scoring 100,000 points in Laser Blast. I say this because that was another game that I found less than stellar, yet I still went after the patch. I’m not going to do that anytime soon with Seaquest. 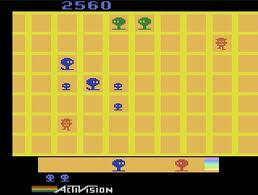 Garry Kitchen’s first game released in 1983 was Keystone Kapers. 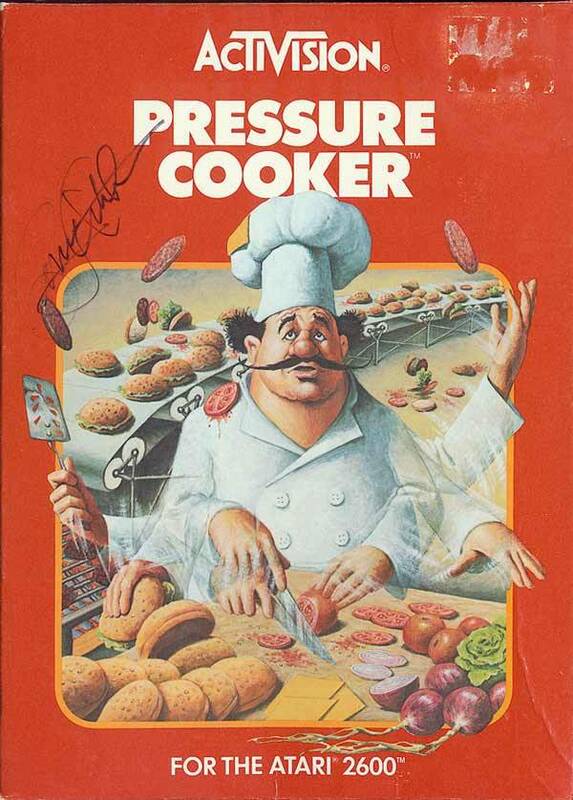 Ironic that I write about Pressure Cooker after mentioning how Steve Cartwright sought to instill proper dental hygiene in the youngsters with Plaque Attack. Not because hamburgers are detrimental to a healthy mouth, but because they’re a prime culprit in his game. While that game was lighthearted, Pressure Cooker is a little less frivolous, gameplay wise. 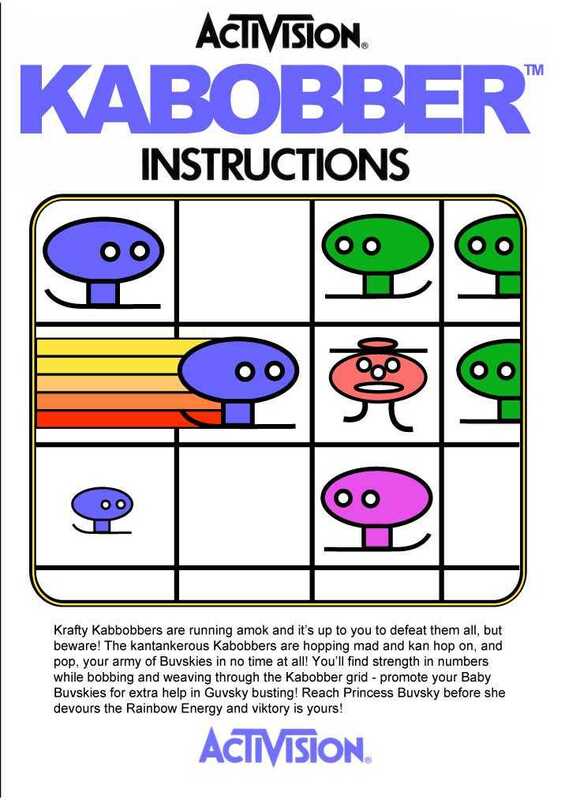 Taking on the role of Short-Order Sam, players must assemble burgers to the specifications of customers. At the bottom of the screen is an electronic order board which lists what the next three customers want on their burgers. Burger patties ride on a nearby assembly line and players must catch ingredients as they’re shot out of a food dispenser. Should they let an ingredient hit the wall or let a patty drop, points will be deducted from the player’s performance rating. If this number reaches zero, it’s game over. With a completed burger in hand, players need to move to the wrapping room and place the burger in the proper receptacle. Filling an order with the incorrect ingredients will also subtract points from a player’s performance rating. 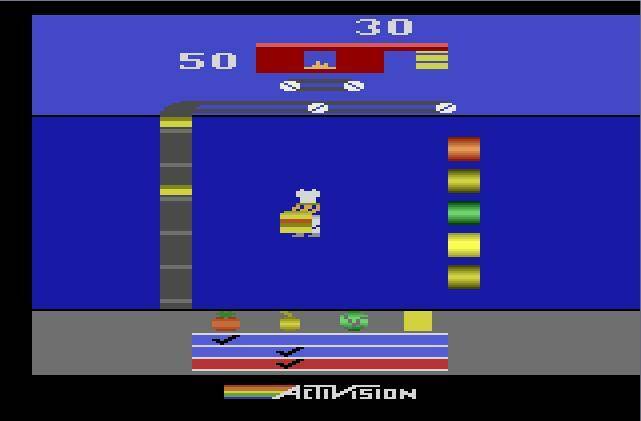 However, successfully assembling and delivering burgers will increase a player’s score, the ultimate motivation. With Pressure Cooker, there were a few gameplay mechanics players had to understand. This was a much needed break from the simplicity found in the majority of these early Activision games. Not that it’s an inherently better game because of that. I enjoyed it and liked that I didn’t immediately understand the game, but I wasn’t in love with it. It’s much more complicated than most of the Activision games I’ve written about. With a score of 15,000 in Activision Anthology, players will join the “Short-Order Squad” and unlock the game’s patch. Originally players had to score 45,000 points of more.